When Boston grocery store magnate Charles Adams tasked Art Ross to name his newly acquired NHL expansion team in 1924, little would he realize the significance it would bear in Boston sports history. As the first NHL team in the United States, Ross (a former player who had been hired as general manager) had to come up with a nickname to personify the traits Adams was looking for in his team; untamed animal displaying speed, agility, and cunning. Along with the team colors reflecting Adam’s grocery chain (brown and yellow), Ross would christen the team with the name “Bruins,” an old English term for “brown bears.” The bear would become the first of many logos for the team throughout the years and the 1924 logo would return in 2016, just in time for the Winter Classic. If you look throughout the history of the Bruins sweater, the bear logo would grace the front up until 1932. For those fans that have been following news on the upcoming Winter Classic, you’ll know that this year the Bruins have decided to go with the blocked brown “B” as a simple nod to the 1932-1934 season. 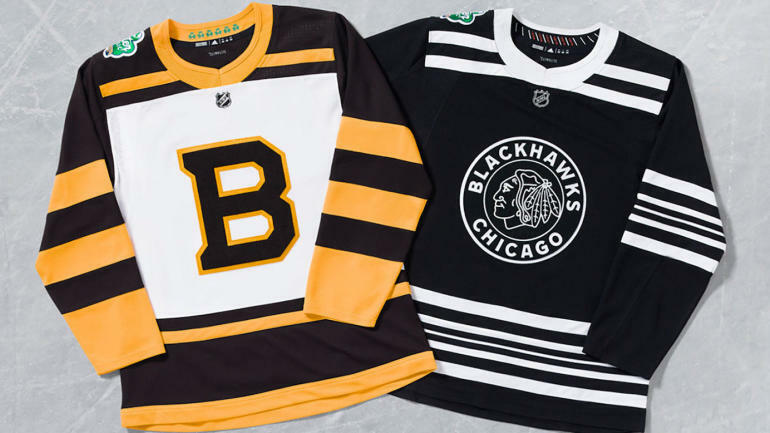 Including this year, Boston will have participated in the event three times, each time wearing a new throwback sweater and with the Classic nearing soon, let’s take a look at some of the designs. In the 2010 NHL Winter Classic that was played at Fenway Park, the Bruins unveiled their sweater for the event: a design that paid tribute to the 1948 season. In that season the team would celebrate its 25th anniversary and what better way to commemorate a special milestone than with a new jersey. The change would see the switch of the brown “B” to the famous Spoked-B that has been synonymous with the franchise. For the Winter Classic, Bruins then Vice-President Cam Neely offered the 1948 inspiration-look to Reebok that featured a variation on the Spoked-B crest. As the first NHL team in the United States and part of the Original Six franchise, the Boston Bruins paid tribute to their history for the 2016 Winter Classic. The B’s would be pitted against one of their oldest rivals, the Montreal Canadiens. To mark the special occasion, the Bruins once again looked to the sweaters of yesteryear as inspiration. This time, the Black and Gold went for the 1924 inaugural season and the familiar old-school Bruins bear would make its re-appearance. And yes, Bruins fans, the bear was around for the 2008-2016 season, however, it looks a tad different than the 2016 Winter Classic design. As a side-note, let’s not talk about the “pooh-bear” sweater-not a big fan of that logo. On January 1st, 2019, the Bruins will make their third appearance in the Winter Classic when they face the Chicago Blackhawks at Notre Dame. As mentioned earlier in the article, Boston’s new jersey features a design inspired by the 1932-1934 season: a simple, classic blocked brown “B” outline in gold. As one of the oldest teams in the NHL, the Boston Bruins have such a rich history that finding a sweater design for a special occasion such as the Winter Classic proves to be an pretty easy task. If you’re looking for a more in-depth look at the logo throughout the years, please check out fellow Black-N-Gold writer Evan Michael’s articles about the best and worst Bruins logos throughout the years.